The College of Idaho’s Cruzen-Murray Library has become a popular and campus-defining landmark since its grand opening nearly a year ago – and the American Institute of Architects has likewise given its seal of approval. At the 2018 AIA Western Mountain Region Conference in Tucson, Arizona on Oct. 5, the Cruzen-Murray Library was awarded the 2018 Design Excellence Honor Award, recognizing the high standard of the library’s design in response to user requirements, site, context, climate and environment. The Honor award is the highest level the AIA grants its recipients. 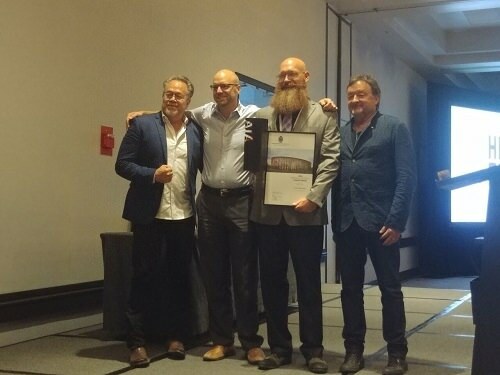 Representatives from the C of I and the Cruzen-Murray Library’s designing architecture firm richärd+bauer were on hand to accept the award last Friday during the annual conference’s awards banquet. Although the group knew in advance the library would receive an award at the conference, they did not know what kind of award they would receive. C of I User Services Librarian Lance McGrath traveled to Tucson to represent the library itself at the ceremony. McGrath gave high praise to Kotter and the rest of the richärd+bauer design team for their role in the Cruzen-Murray Library’s design, commending their professionalism and creativity. The C of I will receive a framed citation for the award to be displayed in the library itself in recognition of the honor.